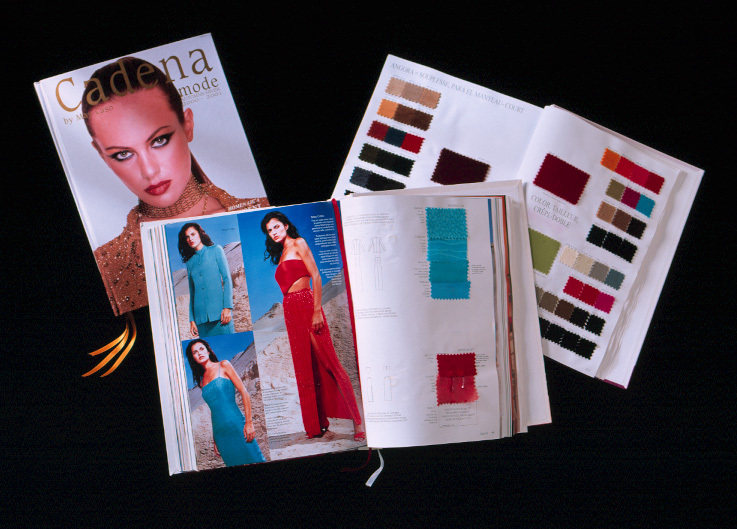 Cadena is a high fashion swatch book designed for the custom couturier and high end sewing enthusiast. The company is located in Madrid, Spain and distributes books to 41 countries. Prices are between $15.00/yard and $500.00/yard with the majority between $50.00 - $150.00/yard. Inventory will be 95% in stock for the first 4 months of each book, after that the fabric will be closed out and not reordered. There will however be some of the same basics each season. A picture of a style with its number at the bottom of the picture. An explanation of the style in 4 different languages. Samples of the fabrics used to make this style the number at the top of the sample. The width of the fabric. At the end of the book there are color cards. Every fabric used in creation of a style is shown on these pages with the whole range of colors. Copyright © 2008 by Fishman's Fabrics, Inc.